Home Page › Posts tagged "Coats"
When it comes to sheepskin coats and other shearling products, the key to purchasing the most comfortable garments made with the highest-quality materials is finding an individual or shop that makes sheepskin slippers and apparel by hand. If you buy sheepskin products from a chain or factory, you never really know what you’re going to get. On the other hand, by visiting (in person or online) authentic sheepskin shops like The Sheepherder in Alma, Colorado, you can ensure that you are going to get what you paid for: a comfortable, warm shearling jacket, coat, pair of slippers or vest, hand-crafted to fit your specific fit, style and color preferences. What’s more, custom-made sheepskin slippers and shearling jackets from authentic sheepskin shops like The Sheepherder can craft quality and comfortable custom shearling slippers for men, women and even children! By creating quality sheepskin slippers made from genuine shearling, and hand-crafted to order, sheepskin shops like The Sheepherder can offer customers a variety of sheepskin slipper options made from the most comfortable and highest-quality materials. One of The Sheepherder’s most popular options for shearling slippers is the Ladies Adult Sheepskin Slipper, a classic scuff-style shearling slipper. With its easy slip-on wear and naturally insulating, breathable and moisture-resistant sheepskin, this ladies shearling slipper is perfect for year-round wear. If you’re looking for a more traditional shearling slipper for women, check out The Sheepherder’s Ladies Sheepskin Slipper, a luxurious shearling slipper choice providing customers the utmost in warmth and style. Crafted from genuine sheepskin, the natural, soft wool keeps your feet cozy, while the authentic sheepskin hide allows your feet to breathe comfortably. The Sheepherder’s traditional sheepskin slipper features wool-out seams for style and a tough cowhide sole for durability unsurpassed by imitation sheepskin slippers. Most men look for exceptional comfort and durability in their sheepskin slippers as well, which is why The Sheepherder also offers the traditional Mens Sheepskin Slipper and scuff-style shearling slipper, crafted specifically for men. Offered in a variety of colors and custom-made to order, these two styles of mens sheepskin slippers offer unrivaled durability and comfort in a stylish shearling slipper. And, since The Sheepherder is an authorized Minnetonka retailer, other popular options for mens sheepskin slippers by The Sheepherder include the Mens Ugg-style Sheepskin Boot and mens Minnetonka sheepskin slippers and moccasins. Made in the USA and crafted from naturally durable, breathable and moisture-resistant sheepskin hide, these mens shearling slippers offer comfort and function for wear in both the winter and summer. The Ugg-style sheepskin boot is 9” high and comes with a non-slip, hard rubber sole for the best grip in winter weather. The mens moccasins feature thick, dense and luxurious sheepskin wool on the inside, with 100% shearling hide on the outside, and an indoor/outdoor hard rubber sole on the bottom to keep your sheepskin moccasins lasting longer than ever. When purchasing your ladies and mens sheepskin slippers this year, don’t forget about the kids! The Sheepherder keeps function, comfort and warmth in mind when crafting childrens sheepskin slippers, offering a diverse selection of shearling footwear options perfect for any season. 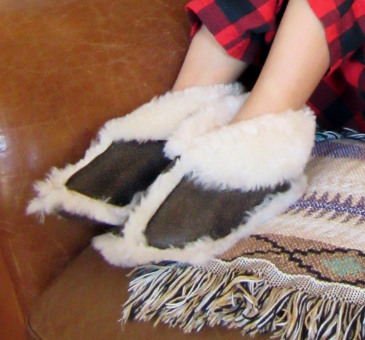 Check out the traditional Kids Sheepskin Slipper and find that The Sheepherder offers these traditional adult slippers in a smaller size without sacrificing quality or durability. Keep your childrens’ feet comfy and cozy in these sheepskin slippers, and you may find you have a hard time getting them off their feet! Sheepskin’s natural hollow fibers wick away moisture and will keep your kids’ feet warm in the winter and cool in the summer, unlike imitation shearling slippers. And with The Sheepherder’s great prices on kids sheepskin slippers, you’ll have a hard time saying no to this great sheepskin slipper purchase! 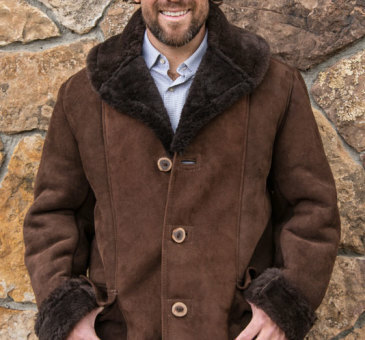 The Sheepherder, of Alma Colorado, has been designing and creating one-of-a-kind custom-made shearling outerwear and sheepskin slippers in Colorado since 1989. Every sheepskin item created by The Sheepherder is handmade by owner Diane Blessing, providing customers with unique shearling apparel and genuine sheepskin slippers, among other quality sheepskin products. Located in the Rocky Mountains of Western Colorado, The Sheepherder store devotes custom, personal attention to each and every product, ensuring that sheepskin items are handcrafted to fits customers’ specifications for fit, color and style. Unlike chains and third-party retailers, The Sheepherder creates all of its apparel and sheepskin slippers from genuine sheepskin, or “shearling,” which refers to the natural hide and wool of the sheep. The hide has silky wool on one side and smooth suede on the other side. Unlike imitation sheepskin products, the high quality shearling used in Sheepherder products is one piece of continuous natural hide, which means the wool is not mended, sewn or glued to the suede. The Sheepherder also creates deerskin vests for women, elkskin vests for men and deerskin booties for infants and children. These Sheepherder garments are made from authentic hides and have an additional cloth lining on the inside for optimum comfort and warmth. Sheepskin outwear garments created by The Sheepherder feature top quality sheepskin for the body of the garment, with natural deer and elk antlers that the animals shed annually for the truly unique buttons. These attractive and durable items are created by hand with premium products to ensure comfort and flexibility. Unlike chain or big-box sheepskin items, Sheepherder products are custom-made to the specific requirements of the customer, which means your product will be specifically tailored to fit you and no one else. The shearling garments created by The Sheepherder are made from the skins of domestic sheep from the Rocky Mountain states. They are raised commercially for their meat, and the hides are a precious by-product which is tanned and processed right here in the United States. It’s important to know where your sheepskin product comes from to ensure that you’re getting the high-quality product that you expect from sheepskin garments. The full process of creating quality sheepskin used to make Sheepherder sheepskin jackets, sheepskin slippers, vests and headwear takes twenty-one days. The end product is a hide that naturally wicks away moisture from the body and remains cool even in hot temperatures. Unlike synthetic sheepskin garments, Sheepherder products keep you warm and comfortable, but will not make you sweat. Sheepskin slippers are one of the most popular products designed and created by The Sheepherder, and since they are handmade according to your specifications at the time of your order, you can own a one-of-a-kind item tailored to fit your exact measurements. In fact, if you need an especially large or small item, The Sheepherder can accommodate almost any size request. Sheepskin is known for its natural comfort, durability and warmth, which is why sheepskin slippers and Ugg-style sheepskin boots are so popular for winter apparel. Sheepskin is a natural, sturdy fabric and, with proper care, Sheepherder sheepskin slippers can withstand the elements and last nearly a lifetime. When purchasing a shearling jacket, sheepskin slippers, sheepskin mittens or gloves, or an elkskin or deerskin vest, it is important to make sure the product is up to par. Diane Blessing of The Sheepherder in Colorado has been designing and creating quality sheepskin products for over twenty years, and can ensure that you receive a comfortable custom-made product suited to your every need. Buying sheepskin products from chains or third-party retailers can be risky if you don’t know exactly what you’re going to get. By contacting and ordering from The Sheepherder of Alma, Colorado, you can feel confident that your custom-made sheepskin product will be handmade with the highest-quality products and impeccable attention to detail.